Some shoppers purchase green beans by scrutinizing each one. Others examine a carton of strawberries from all angles, pulling out one box after another, toppling them over and getting the stink eye just for the best-looking fruit. Melissa D’Elia is that particular about food—but for additional reasons. She’s looking for food that promotes health. The New Jersey native is a personal chef, a gun for hire to help professional athletes with their diets. After studying biochemistry, attending culinary school and owning a vegan restaurant, she had collected enough anecdotal proof to know which foods are good for brain health, building endurance and reducing inflammation. with cannabis—she grew up in the culture and had been cooking with it—so she obliged. She met former Baltimore Raven offensive tackle Eugene Monroe at the shoot, struck up a rapport and recently prepared a cannabis meal for him and his friends. 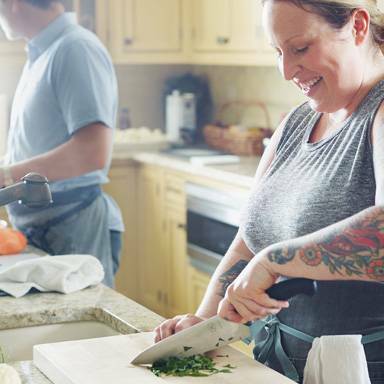 Because of Monroe’s ailments—debilitating joint pain and unrelenting headaches among others—she focused on plant-based dishes to avoid ingredients known to exacerbate inflammation. But Monroe had just returned from a fishing trip in the Pacific Northwest with a fresh-caught wild salmon that D’Elia was eager to prepare. Foods rich in healthy oils like the omega 3 fatty acids in salmon or nutrient-rich avocados and coconut milk, promote brain health, D’Elia says, so they would be included in the meal. For Salmon en Papillote with Fennel Fronds, Lemon and Terpenes recipe, tap here. For Infused Sweet Potatoes with Ras al Hanout and Vegan Labneh recipe, tap here.